Front of Emplant, Rev 1.4? Normally provides Apple Macintosh emulation but a 586 module is available to emulate PC compatible software. 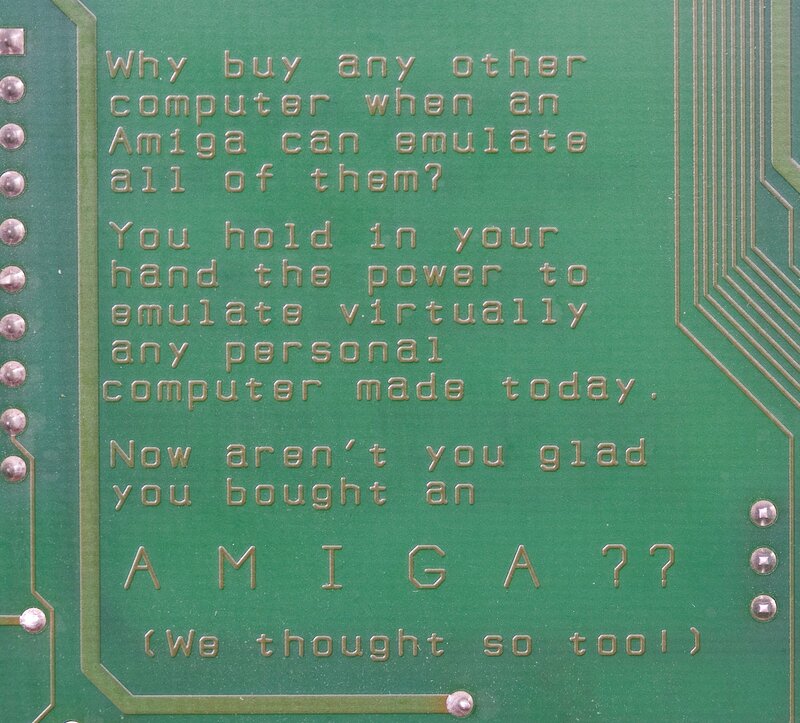 The Emplant is a Zorro-II board that, in combination with the appropriate software, makes it possible to emulate other computers on the Amiga system. The Emplant hardware performs several functions. Sockets are provided for both DIP- and SIMM-packaged ROMs (the ROMs of the "target" computer are installed on the board, then copied to image files, and removed). Also provided are two Macintosh-type serial ports and a basic, no-frills, non-autobooting SCSI-1 interface based on the 53C80 SCSI chip. There are also empty sockets for audio digitizing chips on the Emplant board, but the software has never been implemented. The dual serial ports and the SCSI controller are optional, and some models of the board come without one or both of these options. A "RsrvMem" command added to the the beginning of the startup-sequence sets up the MMU for use with the Emplant board. If you wish to remove the Emplant from the A4000, it's best to remove this command first, or getting the machine to start may be impossible. Early versions of the board came with "ST" brand serial chips, "LOGIC" brand SCSI chips, or custom GALs with date codes earlier than 4693. All of these chips caused problems; the serial and SCSI chips with their respective ports, the GAL chips with general operation. A commonly-defective -5V regulator on the A4000 motherboard can cause the Emplant board to fail diagnostic tests and not perform properly in other ways, including unreliable operation of AppleTalk devices. The included diagnostic program is often a source of concern; reports indicate that it doesn't work properly on PAL machines, and often it can't locate the Emplant board, even if there are no problems. This may be a problem specific to the A4000. Right: Default (gated write select). Left: Signal pulled up to +5V. Upper: Supply power to 28-pin DIP. Lower: Supply address line for 32-pin DIP. On: Supply SCSI terminator power. Off: Do not supply SCSI terminator power.